A very rare British 1853 Pattern Cavalry Trooper's Sword - 2nd Dragoons Scots Greys. This sword was carried by a trooper in one of the most famous Scottish heavy cavalry regiments in the British Army who took part in some of the most noted battles in British Army history, including Waterloo (1815) when a Sergeant Charles Ewart of the Scots Greys captured the French eagle. The Scots Greys were also present at the Charge of the Light (and Heavy) Brigade during the Crimean War (1854). 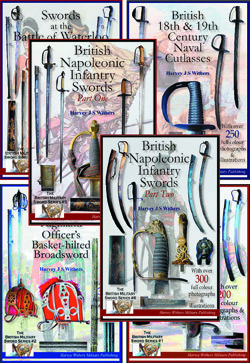 Unlike many 1853 Pattern swords that were carried after the Crimean War, the Scots Greys actually carried this new pattern of sword (mixed with some of the old 1821 Pattern Light Cavalry Trooper's Swords) during the Charge of the Heavy Brigade. They were one of the first cavalry regiments to be issued with the sword in 1854 and their commanding officer, Lieutenant-Colonel Henry Darby Griffith, was very uncomplimentary about its effectiveness during the charge. After this conflict they went on to serve in England, Scotland and Ireland. This sword is in relatively untouched condition and retains dark age patina to both the hilt and scabbard - the patina matches so I do not believe that they have ever been apart. The hilt is of three-bar form with a pressed leather grip, held together with steel pins. The blade has an official inspection stamp to the forte. The scabbard is stamped 2DG/B/24 (2nd Dragoons B Squadron Sword/Trooper No.24). The sword has obvious signs of service and age wear - the grip leather has opened along the backstrap and there is wear to the metal of the hilt and scabbard. These swords had a long and hard service life and the appearance of this sword just adds to its overall character and history. Blade length is 35 inches (41 inches overall). A rare sword to a highly sought after regiment.